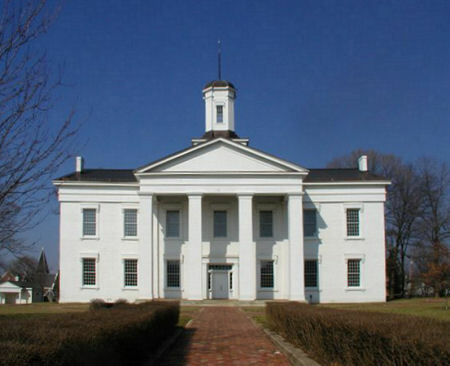 The first capital of Illinois was in the village of Kaskaskia, a settlement located along the Mississippi River that was one of the first permanent towns in the state. It was not realized in the early 1800's that the settlement was doomed by being located between two high points along the river... and also (some say) by a terrible curse! It would be wiped out be a flood a few years later. After much debate about moving the capital, the legislature finally decided on a beautiful spot in the uncharted woods of Illinois and called it Vandalia. It was located north on the Kaskaskia River and surveyors plotted out a large town by standards of those days. A two-story state house was constructed for less than $5000 and in 1820 the Second General Assembly first convened. Almost three years later, the original building burned down and a new structure was erected in it's place. This building still stands today, although the capital of the state was moved to a more centrally located Springfield in 1837. One of the early legislators who worked in the cramped state house and crowded into the local boarding house was a young man named Abraham Lincoln. It was in this building that he made one of his first speeches against slavery and many have said that his spirit still visits here to walk the wooden floors of the upper level of the building. 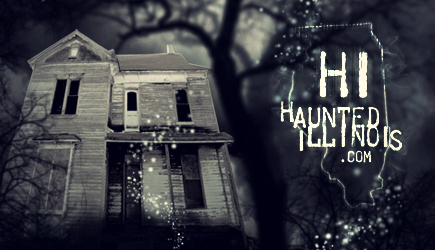 Some claim that his ghost has been seen standing on the upstairs balcony, looking out of the windows and contemplating the issues that must have perplexed him in those early days. While this site has been mentioned because of it's ghostly connections to the past, I would urge you to take this Lincoln sighting with the proverbial grain of salt....how many places can "Honest Abe" still haunt today? With the White House, his former home in Springfield, the Lincoln Monument, and now the Vandalia State House....he must be the most well-traveled ghost in history! The Vandalia State House is located at the intersection of Route 51 and Route 40 in south Central Illinois. It is also located along Interstate 70. The building is open daily for tours.